Joseph Baron was born at Crofton, Wakefield in late 1896, the son of Lancastrian Joseph Baron and his wife, Cheshire-born Elizabeth (nee Higgin) who married in Lancashire in 1883. Joseph Baron was a colliery winding engineer and the couple had eight children from their marriage. Sadly, two died before April 1911. Joseph Baron senior and his family had travelled widely and each of his surviving six children was born in a different location. The pattern of movement, no doubt seeking work, continued during Joseph junior’s short life and, in 1901, the family lived at Glasshoughton, By 1911, the Baron family were living at High Street, Morley, where 14 year-old Joseph Baron junior worked as an errand boy at a stone quarry. At some time later they moved to live in Pickersgill Street, Ossett. 7th (Service) Battalion of KOYLI was Formed at Pontefract on the 12th September 1914 as part of the Army Orders authorising Kitchener's Second New Army, K2 and attached to 61st Brigade in 20th (Light) Division. Early days were somewhat chaotic, the new volunteers having very few trained officers and NCOs to command them, no organised billets or equipment. The units of the Division first assembled in the Aldershot area with brigades at Blackdown, Deepcut and Cowshott. Artillery was particularly hard to come by, but eventually twelve old guns arrived from India in February 1915. When, in the same month, the Division moved to Witley (7th), Godalming and Guildford, the artillery had to go by train as there were insufficient harnesses for the horses. Another move was made, to Salisbury Plain (7th), in April 1915. The Division was inspected by King George V at Knighton Down on the 24th June 1915, by which time all equipment had arrived and the Division was judged ready for war. On the 24 July 1915 they landed at Boulogne and on the 26th July 1915, the Division completed concentration in the Saint-Omer area, all units having crossed to France during the preceding few days. Early trench familiarisation and training took place in the Fleurbaix area. The Division served on the Western Front for the remainder of the war, taking part in many of the significant actions. Joseph Baron died during the Battle of Flers-Courcelette (15th - 22nd September 1916) when 7/KOYLI were involved in the fighting. The battle was the third main phase of the battle of the Somme. It is best known as the first tank battle in history, as it featured forty nine Mk I tanks, although not all of the tanks made it into battle. On the 16th September 1916, Guards Division, reinforced by 61 Brigade of the 20th Division, renewed it’s attack north of Ginchy at 9.25am. 7th Battalion, Duke of Cornwall’s Light Infantry and 7th Battalion, Somerset Light Infantry moved forward from Trones Wood before dawn and formed up 200 yards in front of 2 Guards Brigade in Serpentine Trench. At Zero Hour they advanced and captured the section of the Ginchy-Lesbouefs Road that had been the Guards’ third objective the day before. The 7th Battalion, KOYLI was then brought forward to secure the right flank while 12th Battalion, The King’s Regiment secured the left. German bombing attacks on the flanks continued all day. It was 1.30pm before the 3rd Guards Brigade was organised after the fighting of the previous day. The brigade advanced without artillery support. 1st Grenadier Guards and 1st Welsh Guards suffered heavy losses to machine gun fire, before digging in between Punch and Calf Trenches, 250 yards short of their objective. Private Baron's army service record has not survived, but he was awarded the British and Victory medals though not the 1914-15 Star, indicating that he did not serve overseas before the 31st December 1915. 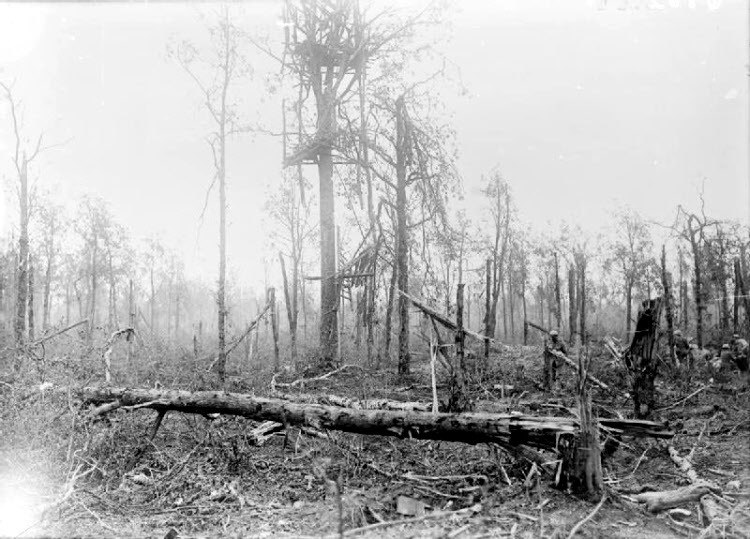 Above: A damaged German observation post in Trones Wood, near Ginchy in August 1916 after being taken by the British. The wood was heavily fortified by the Germans. Private Joseph Baron, son of Joseph and Elizabeth Baron, of 5, Pickersgill Street, Ossett, died on the 16th September 1916, aged 19 years, and is buried at grave reference II. C. 38. at Bronfay Farm Military Cemetery 1, Bray-sur-Somme, Somme, France. Bray-sur-Somme is a village 8 kilometres south-east of Albert. Bronfay Farm is 3 kilometres north-east of the village on the road to Maricourt and the Cemetery is on the south-east side of the road opposite the farm. The cemetery was begun by French troops in October 1914, but little used by them. It was used by Commonwealth troops from August 1915 to February 1917, particularly during the Battle of the Somme, when the XIV Corps Main Dressing station was at the farm. During the retreat and advance of 1918, further burials were made and after the Armistice, graves of March, August and September 1918, were brought in from the fields between Bronfay Farm and Bray. Bronfay Farm Military Cemetery contains 537 burials and commemorations of the First World War. 13 of the burials are unidentified but there are special memorials to two casualties believed to be buried among them.